After living through the market debacles of the past few years including the market crash of 2008, the “flash crash”, and European sovereign debt crisis, risk and its mitigation have become an important consideration for asset owners, including pension funds, endowments and foundations. The most important components of risk management are the identification and understanding of portfolio risks and the development of a concise step by step approach to hedge that risk across asset classes. So how do investors get there? To mitigate tail risk, investors need real world examples, common sense solutions, and an awareness of the advantages and disadvantages of each hedging alternative. Given the potential dire effects of a tail risk drawdown event, investors should seek out, analyse and implement various hedging strategies to help mitigate the potential investment losses of such events. Tail risk is broadly described as the risk of extreme market moves that typical financial and risk models employed on Wall Street or in the City tend to underestimate. 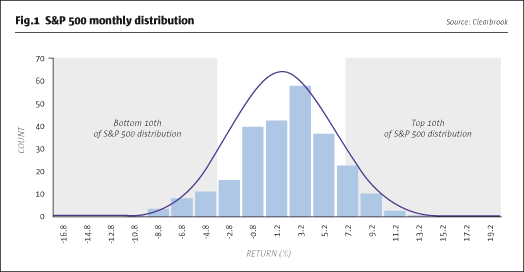 A tail risk event for our investors is an event, as defined in our stress testing analysis, that has a 10% probability or less of an occurrence such as the 1987, 2000, and 2008 stock market crashes. Though such events are rare, the magnitude and implications of a potential loss can be dramatic for investors. A pension fund’s underfunded status will worsen and affect its ability to meet the future financial obligations to its pensioners. An endowment or foundation may not be able to meet its annual spending targets, thus delaying or even terminating capital spending projects or student tuition assistance programmes. Table 1 illustrates the types of losses investors could experience during a “stressed occurrence.” The occurrence is defined as an equity market dislocation having a probability of less than 10% and having a monthly decline threshold of -4.10%. The S&P 500 data shows that from the period spanning 1992 to 2012, the S&P 500 during a stressed period experienced an average arithmetic mean quarterly drawdown of -7.9. Tail risk protection strategies typically employ investment strategies, securities, or derivatives that can help to mitigate or offset downside risk, or provide a non-linear payoff in the case of a significant market down draught. In this strategy review, we will explore and highlight methods and strategies that can be used to hedge tail risk events, specifically in regards to equity markets, rising interest rates, and inflation. Individual security and index/volatility put and call options are the most commonly used instruments for hedging equity risk. In addition, collars and put spreads are also employed. These strategies – used in the right mix of puts and calls, volatility levels, and expiration dates – can be cost-effective, highly liquid, and effective in stress scenarios. It is worth noting that over the time periods when the S&P 500 has gone through a negative period, the VIX experienced a negative correlation to the equity markets in times of market distress. This relationship is beneficial to options strategies as volatility is a main pricing component of option premium levels. There are a number of credit hedging instruments that are normally used including credit default swaps (CDS) on individual issuers, CDS indices (CDX.IG, CDX.HY on US corporate credit), options on CDS indices, and Tranches on CDS indices. Credit strategies are a moderate cost hedge except in stress scenarios and are effective as a tail hedge when the underlying issuer carries default risk. These instruments include VIX options and futures, volatility ETFs, OTC variance swaps, and volatility ETNs based on S&P 500 VIX futures indices. These products have become quite popular due to their effectiveness as a hedge for tail risk, good liquidity for short to intermediate expiration dates, and an increasing range of products to choose from. CTAs and managed futures involve the systematic or discretionary trading of futures, forwards, and options. These strategies invest in multiple asset classes and trade in equities, currencies, bonds and commodities such as gold, silver, wheat, oil, corn and coffee among many others. Typically CTAs and managed futures have a low correlation to equities and bonds, prompting investors to view them as a hedge against market risks. Short-bias funds tactically adjust the level of their short exposure through market environments, but do maintain a constant short net market exposure, with the intention of providing positive returns in declining markets. Equity short-biased funds typically perform by identifying overvalued companies or those that are experiencing negative idiosyncratic events that will cause their market prices to decline. Although these funds can be volatile, they are negatively correlated to the equity markets. Due to the recent rise in commodity prices and gold, investors have come to view commodities as a way to hedge downside risk. This view has been fostered by the increase in the price of gold during times of market turmoil. Gold for the past several years has been seen as a safe haven, a currency proxy, as well as a hedge against rising inflation rates. Treasury Inflation-Protected Securities (TIPS) are debt instruments issued by the US government. TIPS, unlike most Treasury securities, have their principal value increase with inflation and decrease with deflation, as measured by the Consumer Price Index. When TIPS mature, the note holder is paid the adjusted principal or the original principal, whichever is greater. TIPS make interest payments twice per year. Because the interest rate is applied to an adjusted principal amount, the interest payments made will rise and fall with inflation. High-yield loans, known as bank debt, are a unique fixed income asset class. These senior, floating rate corporate loans are commonly issued by below-investment-grade companies for the financing of acquisitions, capital expenditures, and general operating purposes. Loans are underwritten by a lead bank and syndicated to other banks and institutional investors. They are technically not securities, nor traded on any exchange, but rather traded “over the counter”. Loans pay a floating rate of interest made up of a base rate (LIBOR), plus an additional fixed coupon called the “spread” or “credit spread” to compensate for credit risk. Interest payments are usually paid quarterly, and in some cases more frequently. Bank debt bears the unique combination of seniority, security, and covenants, which helps maintain relatively high recovery rates in the event of default. Loans are typically “senior” in the issuer’s capital structure to other outstanding debt, in that the loan’s interest and principal payment must be paid before the other creditors receive any payment. The floating rate nature of these securities and typical short maturity of five years or less helps to mitigate some of the duration risk in a rising interest rate environment. Direct lending involves the providing of Senior Secured 1st and 2nd lien loans to companies by financial institutions and investment management firms, that pay LIBOR-linked interest payments. This area fills a huge void in commercial finance left by the departure of many large participants, particularly banks who are now subject to stricter capital requirements as per Basel III. Quarterly cash payments are made to investors and yields on average range from 10-12%+ per annum. In many of these loans, an equity kicker can be negotiated as part of the loan package. As these loans are private transactions, possess interest rate floors as well as the ability to reset as LIBOR rises, they are essentially protected from the negative effects that a rise in interest rates would typically have on publicly traded fixed rate debt instruments. Commodities serve as an investment that can rise in value during bouts of unexpected inflation, or in virulent inflationary periods such as the 1970s when commodities such as oil and gold strongly rallied in price. A commodity is fungible, that is, equivalent no matter who produces it and maintains roughly a universal price. Well established physical commodities have actively traded spot and derivative markets. Commodities are also accessed today more so than ever before through ETFs, ETNs, commodity indexes and commodity index funds. Generally, commodities are basic resources and agricultural products such as iron ore, crude oil, coal, salt, sugar, coffee beans, soybeans, aluminum, copper, rice, wheat, gold, silver, palladium, and platinum. Soft commodities are goods that are grown, while hard commodities are the ones that are extracted through mining. Some investors have difficulty in establishing direct exposure to an asset that is incapable of generating cash flows. Moreover, many are concerned about the potential impact of contango on commodity investments, noting the considerable gap between a hypothetical return on oil and gas prices and the performance of investment vehicles linked to those commodities. Some investors have embraced stocks of commodity-related companies as a means of establishing indirect exposure to commodity prices, while avoiding the potential pitfalls of a direct investment. For which investors does tail risk hedging apply? Tail risks do exist but the efficacy and cost-effective implementation of these risk hedging strategies differs from investor to investor. To determine the appropriate choice and use of a hedging technique we begin with an analysis of a client’s portfolio risk and return factors/exposures. This assists us in understanding the desired portfolio performance and the constraints a hedge would be subject to. The initial conversations would likely include a discussion of pertinent portfolio and hedging parameters involving a single security (concentrated single stock exposure), theme/industry exposure (high technology holdings), asset class level (too much beta versus the S&P 500) or portfolio level (too high an exposure to credit risk). Another factor is determining the use of hedging to help investors meet their funding needs and pension liabilities. A low interest rate environment is detrimental to pension plans as declining rates increase the value (and cost) of liabilities. After understanding our target portfolio’s holdings and risk and return factors/exposures, we decide whether to employ an active hedge or to diversify investor asset allocations to reduce portfolio risk. Active hedging is used to mitigate a specific risk such as high portfolio correlation to the S&P 500, while diversification even into cash can lower the portfolio’s overall correlation between asset classes. Finally a decision would need to be made in regards to the appropriate hedging instrument that may be used by the client. The issues to consider here are whether the client is qualified to implement such a strategy, whether derivatives are allowed in the portfolio, whether leverage is permissible, what is the investment time horizon for the client and whether these risk measures are to be tactical or strategic. What is the cost of hedging? The timing of a hedge is important. In a relatively calm market, implied volatility is low, thus insurance is inexpensive. A simple analogy: is it cheaper to buy fire insurance before or after your home is on fire? An asset owner must be cognizant of the present market environment when considering a hedge. Liquidity is an important consideration as well. Highly liquid and heavily traded S&P 500 Index options are easily purchased and carry low transaction costs, versus purchasing a put option on a semi-liquid small cap OTC stock which can be illiquid and carry a high transaction cost. The investment horizon for a hedge is important as with timing and liquidity; typically the cost of a longer-dated hedge is more expensive. That being said, in periods of market calm, the volatility skew tends to be flat. Thus the cost differential between a longer and shorter-dated hedge will tend to converge in such periods. The investment horizon will also affect the choice between an individual security, sector, index or volatility hedge. The funding cost of a hedge also needs to be considered as hedges can be paid for in full, via a premium payment or a partial payment through the posting of margin. The complex nature of the hedging solution will also have a bearing on the cost, whether it involves only one instrument such as a put option, or several option combinations such as a “condor”, “forward” or “reverse” conversion. The size of the hedge will also increase or decrease the transaction costs, due to liquidity consideration and potential economies of scale. The use of the correct and most applicable hedge is crucially important. Many off the shelf tail risk solutions will tend to try and hedge beta, volatility, interest rate and credit risks. If some or none of these risks are inherent to your portfolio, you are paying an exorbitant fee for no benefit. As such, an effective hedging programme needs to be customized specifically for each client portfolio.